Streams are more than just channels of flowing water. These babbling brooks are also teeming with animal and plant life. Some of these animals and plants are easy to see, while others are microscopic. Some cling to the bottom of the stream, while others float on the surface in the stiller waters along the sides of the stream. Many plants that live in streams are considered to be invasive weeds. Water hyacinths (Eichhornia crassipes) are floating plants commonly found in streams, lakes and ponds in the Southeastern corner of the United States as well as in California and Washington. The plant is considered very invasive and can grow as large as 3 feet tall, according to the University of Florida. Water hyacinths flower with lavender blooms. These pretty plants can quickly cover the surface of a body of water with a thick, heavy mat of vegetation. Muskgrass (Chara species) is a type of algae that grows along the bottoms of streams and rivers as well as ponds. It is a multi-celled algae with a structure that looks much like a flowering plant, according to the University of Florida. Although muskgrass looks as though it has small leaves, they are actually small branches (branchlets) forking off the main branches. The plant has a rough texture and smells like garlic, which is how it got its common name. Diatoms are microscopic, one-celled plants, according to Stream Biology and Ecology. They coat the wet surfaces of items in and around streams, including boulders, wood, plant debris and even the bottom of the stream. These colonies of plants have a yellowish-brown appearance and create a very slippery surface, which is why it is sometimes hard to walk along the bottom of a stream. Diatoms are a favorite food source for many aquatic animals. 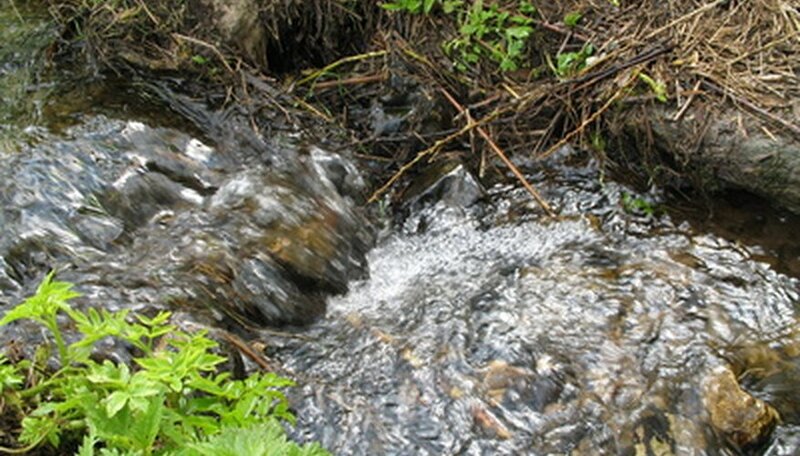 Fast-moving water in the stream can break up the groups of diatoms, which causes a foamy reaction. Giant duckweed (Spirodela polyrhiza) is native to the United States. This floating plant lives in slower streams and pools of water along the edges of the streams. The plant has two or three round leaves that are connected in the middle, with roots that dangle down from them. The leaves are dark red underneath and green on top. The name "giant" is deceiving as the plants are about 1/4 inch across. Giant duckweed grows rapidly and can completely cover the surface of still bodies of water, cutting off sunlight and reducing the amount of oxygen in the water. For this reason, it is classified as an invasive weed in many states.